The first machine to make tacks successfully in this country was designed and built by Thomas Blanchard about 1806. He worked for six years on his invention before it was finally perfected. Previous to the date of his patent, 1812, tacks were handmade by a slow and tedious process. So well did the inventor design his machine that the original invention remained practically the same throughout it's production life. the one outstanding change is that instead of being fed by hand, machines are fed automatically. One operator now attends a large number of machines. The tack plate from which tacks are made is a soft steel which comes in sheets from twelve to forty inches wide and thirty-six inches long. the tacks are made by slicing or shearing wedge-shaped pieces from the end of the strips of tack plate chopped from these sheets. In tack making, these sheets are first pickled in hot sulphuric acid, washed in cold water, then dipped in boiling lime water, and finally dried on steam coils. The coating of lime neutralizes the acid, makes it easier to hold the material in place while cutting and upsetting, and also seems to act as a lubricant to the cutting tools, thereby greatly increasing their life. After the plate is pickled, it is cut up in a chopper into strips slightly wider than the length of the tack to be made. It is impossible to cut strips unto the limit of the width of the sheet. This means that a strip of odd size is left over at the end. These end strips are not wasted as they are gathered together and with the use of a side stripper attachment, they are cut up into narrow pieces for use in the making of smaller sizes of tacks. The narrow strips of tack plate, thirty-six inches long and of a width determined by the length of the tack, are fed into the tack-making machine. Tacks, after cutting, are sifted to remove slivers, after which they are polished, blued or plated as may be desired before packing. 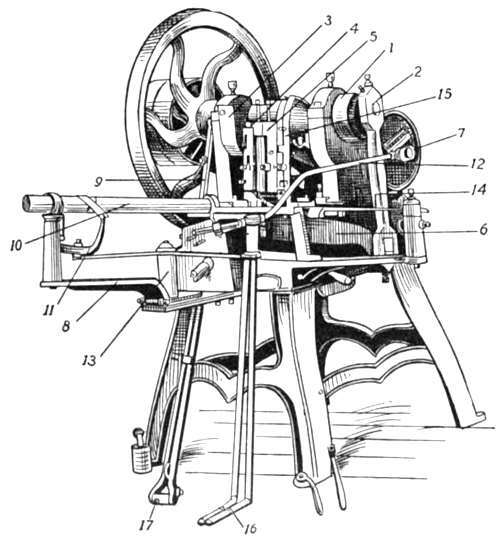 The majority of machines for making tacks and auxiliary equipment were made by the Henry Perkins Company of Bridgewater, MA. The above information courtesy of the Henry Perkins Company.